DPF Diesel Particulate Filters | Roadwarrior Inc. DPF Product Information – Roadwarrior Inc.
Diesel Particulate Filters are extremely effective at controlling the output of harmful emissions from diesel engines by trapping diesel particulate matter (PM) and allowing it to combust into carbon dioxide. The composition of PM is mainly soot (carbon), but will also contain lube oil ash, hydrocarbons and sulfur oxides. In properly working DPFs, visible soot is virtually eliminated from tailpipe exhaust. Roadwarrior DPFs contain a cordierite filter with alternately plugged channels. The exhaust gas is forced to flow through the filter walls, trapping particulate matter such as soot, hydrocarbons, and lube oil ash, and allowing exhaust gas to pass through. As this particulate matter collects on the walls of the filter channels, a periodic regeneration takes place to burn off the trapped soot by an increase in DPF temperature. This regeneration is accomplished through a thermal management strategy that is incorporated into most 2007 and later model year heavy duty diesel engines. In 2007 EPA emissions regulations were changed to require most US and Canadian heavy duty vehicles be equipped with a Diesel Particulate Filter (DPF). As of 2010, DPFs became standard equipment on all new makes of heavy-duty trucks in the US and Canada. Starting in 2013, all European heavy-duty trucks also require DPFs to meet EU emissions regulations. All Roadwarrior parts are constructed in North America, by Roadwarrior Inc., using high quality materials to ensure a long service life. Roadwarrior products are backed with a one-year warranty. Roadwarrior DPFs and DOCs are coated with platinum-group metals (PGMs) platinum or palladium to match the catalytic activity level of the OEM component. A PGM coated DPF acts as a hydrocarbon slip catalyst, burning any excess fuel present during active regeneration. 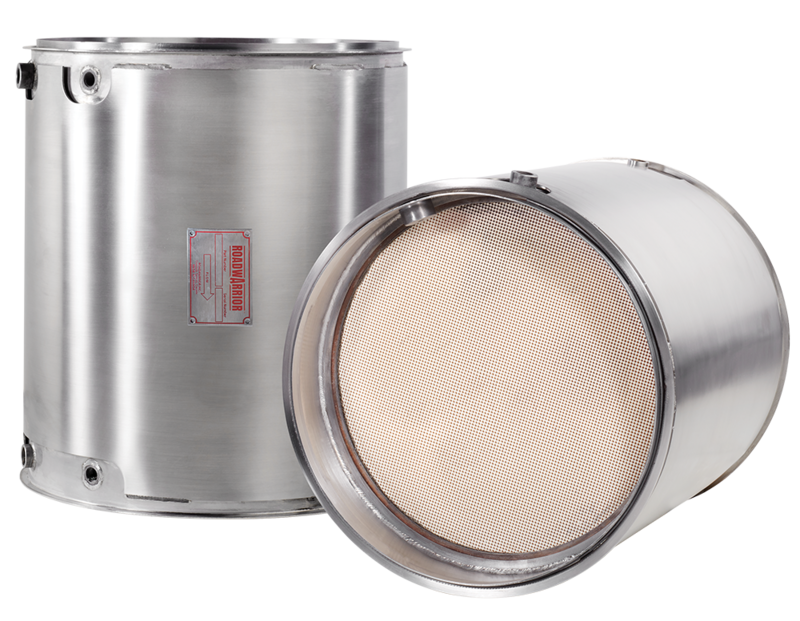 A DPF with a PGM coating will also have a lower passive regeneration temperature which can extend the time between active regenerations, saving on any additional fuel costs.